The Paddington War Memorial is located outside the Victoria Barracks along Oxford Street, in the inner city, eastern suburb of Paddington. It was erected in 1922 and features a single granite monolith set on three granite steps. The base has been squared with names engraved and gilded on three of the four polished granite sides. Inscription reads: For King and Country. In honor of the Paddington men who fought and in loving memory of those who fell during the Great War 1914-1918. 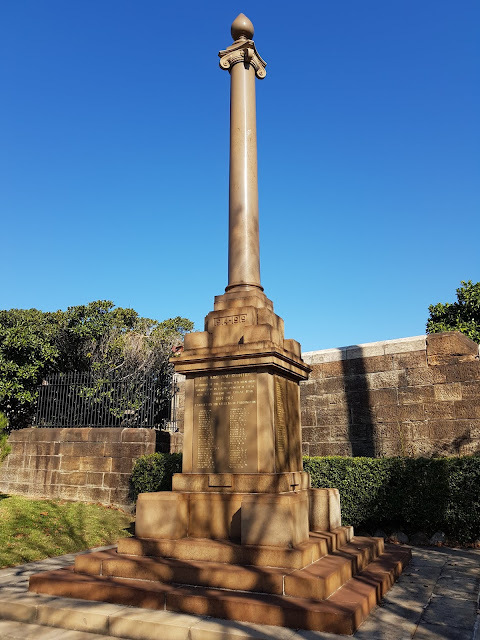 Erected by the citizens of Paddington. Their duty done. Greater love hath no man. Linked to: Shadow Shot Sunday, Sundays In My City, All Seasons. It's very grand and powerful. What a stately memorial. And poignant wording. Lovely shadows ~ another great angle shot too! Carol, yes, sometimes it's a better shot on an angle. I always look for memorials when passing through little towns. Some are very eye-catching, like this one that you share with us today. Wow, made of a single piece of granite - that must have been pretty pricey! Many thanks for sharing this World War I monument with All Seasons this week! have a great week! It is rather a simple yet dignified tribute.